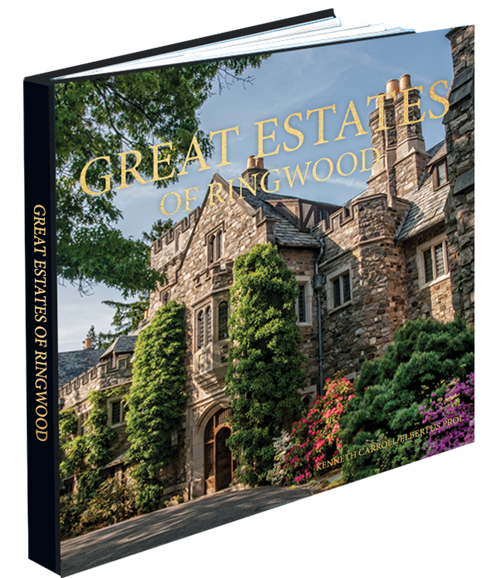 The Great Estates of Ringwood – The Great Estates of Ringwood – 140-page coffee table book. Ken Carroll and Elbertus Prol . Award-winning photographer, entrepreneur, and philanthropist Ken Carroll teamed with former Ringwood, New Jersey historian Elbertus Prol to create an elegant, 140-page coffee table style book Great Estates of Ringwood. Large images and historical facts offer a fascinating explanation of life in Ringwood’s grand manors. Readers will be surprised to find out that there are four stately historic homes in their own backyard. Two are widely known: Skylands Manor and Ringwood Manor, but two have been hidden from the public eye—until now. Mount Saint Francis and Table Rock are also included in Great Estates of Ringwood. Mt. Saint Francis will never be able to be seen in any other way than through the pages of Great Estates of Ringwood. The property has been sold and is undergoing a modernization. Table Rock does not grant tours. The book contains insights, photographs, and facts well beyond any available tours of the homes, offering a true-to-life glimpse of yesteryear. Mr. Prol details the history and artifacts of the mansions, whose grounds featured the prominent landscape designers of their time and whose walls were adorned with art, photography and collectibles. The first printing is limited to 1,500 copies. Purchase now $40 plus $5 in shipping/handling.